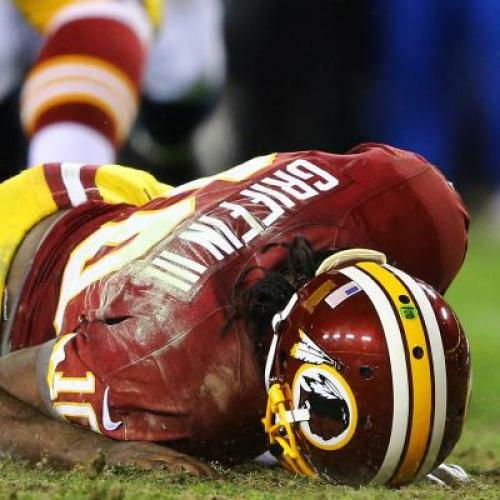 The subtext of the Washington Redskins’ continuing to play an injured Robert Griffin III in their playoff game last Sunday—although the rookie quarterback was visibly hobbled as early as the first quarter, coach Mike Shanahan kept him in until he literally collapsed near the end of the game—is that “gritting it out” was especially important because it was the playoffs, when the stakes are highest. Griffin missed all or parts of three regular season games; but the calculation this time, with the game still in reach, may have been different. “My teammates needed me out there,” Griffin said after the game. “So I was out there for them.” Now Griffin is out in Florida recovering from an operation on his right knee, including his all-important anterior cruciate ligament (ACL). When his teammates need him on Opening Day 2013, there is a chance that doctor’s orders will prevent him from obliging. In the National Football League, playoff games are at least as threatening to players’ safety as regular season games, and probably more so. The stakes are higher, which means players play—and hit—even harder, while the wear and tear from 16 prior games have made players’ bodies more vulnerable. (Anecdotally, the most terrifying hit I have ever seen came when Pittsburgh Steelers safety Ryan Clark bashed Baltimore Ravens running back Willis McGahee in the AFC Championship Game four years ago.) Moreover, many suspect that playoff teams underreport injuries in order to play guys whom league rules might otherwise sideline: Frontline and ESPN noted Monday that none of the eight teams still active reported concussions going into this weekend’s games, in contrast to this past regular season, when an average of more than 10 concussions were reported each week by the league's 32 teams combined. At least these postseason risks come with greater rewards—right? Actually, most NFL players receive significantly less money for their postseason stints than they do for a typical game in October. • In the wild-card round, players on winning teams receive $22,000 each; players on losing teams receive $20,000 each. • In the divisional round, players on all teams receive $22,000 each. • In the conference-championship round, players on winning teams receive $42,000 each; players on losing teams receive $40,000 each. • In the Super Bowl, players on the winning team receive $88,000 each; players on the losing team receive $44,000 each. Team owners have not yet begun to offer comparable playoff discounts on tickets and beer. This is not to say the playoffs can’t be unusually monetizable for players in other ways. A few—most famously, Tim Tebow—are promised bonuses for playoff victories in their contracts. The bigger stage affords the potential for wider prominence leading to lucrative endorsements (like New York Giants wide receiver Victor Cruz, who parlayed a Super Bowl–winning postseason last year into a variety of marketing deals). Executives seek to put together teams that will win in the playoffs, and, rightly or wrongly, they view certain players as better or worse in the clutch: Therefore, solid play in the postseason can lead to higher future contracts. But basically and undeniably, players get less money for the playoffs than for the regular season. Yet as appalling as this is—players who achieve the success of reaching the postseason and sustain the hazards of postseason football are paid less for their troubles—it is hard to separate it from the most basic premise in sports: that winning is better than losing. The players are professionals, but their desire to win is evidently extra-professional, and would be even if they actually were paid more for winning. One need only look at the bench of a team that has just won the championship (or one that just lost it) to understand this; or, one could just look at the CBA they themselves agreed to. This is the business they’ve chosen. It would be nice if players, most of whom grew up as fans themselves, could share fans' happy illusion that winning or losing are all that matter—that there's no glory without guts. But these are professionals plying their trade, who ought to be compensated at a level commensurate with their skills, their market value, and mostly importantly the extra risk they are taking on. “When adversity strikes," Griffin wrote on Twitter, “you respond in one of two ways.... You step aside and give in..Or you step up and fight.” He might truly believe this, but it's worth remembering that by stepping up and fighting last Sunday—because he wanted to, or because he felt pressured to—he can't step up right now, period: He can't even stand.